In mid-May 2018, Jericho Chambers hosted an evening roundtable discussion to answer the question about what makes an economy strong. The discussion elaborated on themes raised in Jericho Times Spring 2018 edition. Participants reflected the breadth and depth of the Jericho community: business leaders, advisory firms, trade unions, academia, activists, campaigners, charities, media and the public sector. The conversation was held under the Chatham House Rule. It’s important to focus on the economy’s functionality. Whether or not we fare better than other countries, we are still currently living through the most protracted squeeze on real wages since Napoleonic times, all playing out against the backdrop of Brexit, thought to be costing the UK £20bn a year, and the evisceration of public services. In addition, recent scandals/ perceived failures in corporate governance confirm the need to establish new operating and accountability principles and new ethical frameworks. When people reject each other’s views as ‘evil’, ‘stupid’ (or both), without due consideration, dialogue is polarised and progress is blocked. Globalisation, localisation, big business and regulation are neither problems nor solutions – they have flaws, benefits and a sure role to play bringing in a renewed strong economy. The tensions and contradictions need to be explored, not simply dismissed. Without it, a cargo-cult mentality develops. Populist narratives emerge, along the lines of: “We may be poorer, we may be less productive, but as a community we will be stronger…” The Berlin market garden, featured in Catherine Fieschi’s essay, sheds some light on the purpose of economies of scale. The garden is not high-yield – those who tend it do not earn much – and yet it offers craft, purpose, routinisation, protection, community, and, most importantly, a pragmatic approach to participation and production, devoid of schmaltz. The economy was never intended as a mathematical abstraction. In the 1930s, even the inventor of GDP, Simon Kuznets, warned against this being used as a measure of welfare. The economy needs to be thought of as a complex network or eco-system – and metrics of strength can be fine-tuned to accommodate how well people fare within this. A “strong economy” must shift thinking beyond GDP. If growth for growth’s sake means more stuff being sent to landfill, we need to rethink. The UK has the potential to lead a shift to a circular economy – and not get left behind. China currently has huge competitive advantage in this space – manufacturing and then re-manufacturing at scale. In times of ‘peak purpose’ there tends to be a lot of rhetoric about a fairer economy, less action. To help its operators make better decisions, the economy needs a new ethical framework, to help inform decisions in the boardroom, in government, in our homes, and in our workplaces. We need to think in in terms of people, not just in terms of profit. We must not abandon our core humanity – we ignore it at our economic and political peril. 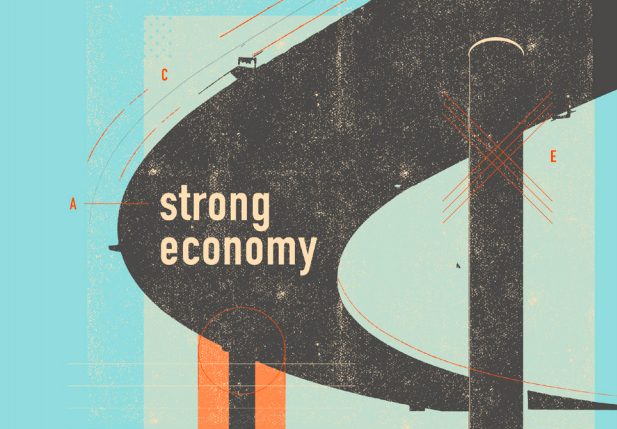 The Strong Economy project draws on a number of Jericho/ client-led projects, exploring how coalitions between business, policy-makers and society can bring in common good thinking and influence a positive future of work, transport, tax, professional organisations, the digital economy, and urban regeneration. To contribute to the strong economy conversation, get in touch.